My daughter likes to be creative. She always comes up with unique cakes that she wants for her birthdays. This year was no exception. For her birthday a couple of weeks ago she choose a banana split cake. We saw a recipe from Martha Stewart that was called banana split cake and she immediately knew she wanted it. She loves bananas. She also likes to be unique and a banana split cake is unique. This cake actually surprised me. I was a bit skeptical about it being good. But it really was. I enjoyed it much more then I thought I would. 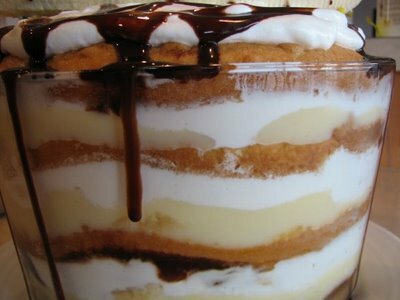 It was the same idea of a layered banana pudding, but with cake and chocolate. I think this cake would make a great dessert to serve a large group of people because you can make it ahead of time. And trifles always look pretty. This is not exactly like Martha’s. I made some changes, but it is the same basic idea. This is a bit messy. The bowl is really full and the final chocolate sauce spilled over, so I placed a plate under my trifle bowl. But it still looked really pretty. Make the pudding; Whisk together cornstarch, 2 tablespoons granulated sugar, and salt in a small bowl. Whisk eggs in another bowl until smooth; whisk into cornstarch mixture. Set aside. Whisk together milk and remaining 6 tablespoons sugar in a medium saucepan. Bring to a boil over medium-high heat. Slowly pour milk mixture into egg mixture, whisking constantly. Assemble the cake: Using a serrated knife, trim tops of cakes level, then cut each in half horizontally, making 4 layers. Place 1 cake layer into the bottom of a straight-sided 4-quart bowl (about 8 inches in diameter and 6 inches high). Spread with 1/2 cup pudding, then with 3/4 cup whipped cream. Arrange 1/4 of the sliced bananas on top; top with another cake layer. Repeat 3 times, decorating final banana layer with a dollop of whipped cream. Drizzle with chocolate sauce on top. This was really full in my trifle bowl. So make sure to drizzle with final chocolate sauce right before serving. Using a large spoon, divide portions among serving bowls. Serve immediately. That looks yummy! thanks for the recipe. And happy birthday to your daughter. Oh no you didn’t. Why do people post things like this when I am clearly five months pregnant? Ugh. It’s not even 10am, and I could easily devour that entire thing. Holy yumminess! Wow that looks amazing! Definetly gonna try this one! I think your daughter sounds like she has impeccable taste!